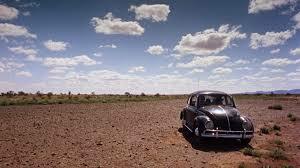 It’s incredible that two of the greatest Australian films – Walkabout and Wake in Fright – were both released in 1971. What a year it must have been, for those who were alive and cinema-goers. Both films are ambitious explorations of Australian identity directed by non-Australians. I watched Walkabout for the first time this week after watching Wake in Fright last month. Walkabout is truly astonishing, a film that is visually captivating, engrossing as a narrative, complex, and still so fresh over forty years later. It’s a dream-like film. It starts with a few scenes from Sydney, as two children and a businessman make their way through bustle to the eerie quiet of their apartment overlooking the harbour and the bridge. Depression hangs over the home, the mother mechanically preparing a picnic while listening to the drone of the radio as the father stares at the pool with a glass of whisky. So much of this story is told visually. The next scene takes us into the outback (no transition shots, just the car fuel tank empty), the setting for most of the rest of the movie. The father has gone mad and starts shooting at his two children, who escape into the outback. It is a harsh environment, but rich with life, the camera showing us every kind of Australian animal imaginable in this mythical outback. (I doubt it’s the filmmakers’ lack of understanding about which animals could actually be found in that part of NSW, but instead an all-encompassing vision of the outback, taking in animals and other aspects from around the country.) It becomes a tale of survival and then of encounter as an Aboriginal youth who speaks no English rescues them. One of the achievements of this film is to convey consciousness effectively: sometimes we are suddenly given a glimpse of the world through one of the character’s minds. The teenage girl’s gaze lingers on the Aboriginal youth’s loins. We switch to the Aboriginal youth’s perspective, as his appreciation of the girl’s long white legs is interspliced with a vision of the limbs of a white gum. This is a rich film open to many different readings without being frustratingly oblique. There is so much in it to ponder over and delight in. I think it will be my favourite film of the year. And there I thought The Castle was Australia’s greatest film – it was the vibe of the thing. Still, you make Walkabout sound like a must see… Where is it available? I saw it on Netflix – but I’ve now exhausted their present “Australian film” category. They don’t have many in it, but they’ve chosen well.